Sant Jordi Alberg is located near Gaudi's architecture on Passeig de Gràcia as well as La Rambla, Barcelona Cathedral and the nightlife of Barri Gòtic. 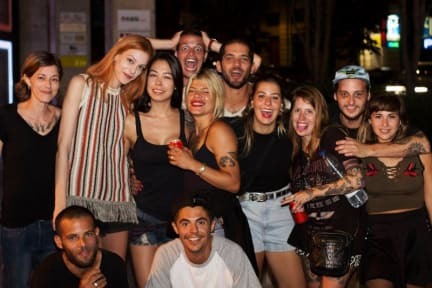 Hostelworld guests have said this is 'a great place to stay if you're looking to meet people and party in Barcelona'. Our reviewers have recommended it for lone travellers because 'it is more of a family house than a hostel, really: everybody gets to know each other, the atmosphere is awesome and in the night-time the party breaks loose'. Had a great time at Sant Jordi. Very friendly staff, relaxed atmosphere, bar/club organised for each night. Was only there two nights, but made a lot of friends and didn't want to leave. Great hostel, and Staff (Elisa, Renatto, Claudia) super nice and friendly! I wanna go back! Staying at Sant Jordi Alberg, I’ve started to feel like home real quickly. The place is perfect for everyone traveling solo as you will meet many other cool people in the living room or latest at the family dinner and when going out together. Thanks to the staff, Martin, Elisa and especially the awesome and lovely Claudia and all the other guys, your stay at Sant Jordi will be something very special. I will be back for sure! Would stay again - great location, welcoming and comfortable stay. This was my first time staying at a hostel, and I couldn’t ask for a better experience! Staff was amazing, and Danilo gave me the best recommendation about the city. I would highly recommend those who are planning a trip to Barcelona. Until next time, Ciao! Location is super close to metro stops and walking distance from Gracia, the Gothic Quarter, and Park Guell. The dorm we stayed in was spacious and had a balcony overlooking the street. We had to leave at 4am for our flight, and Gerardo at the front desk was insanely helpful making sure we got on the right bus at the right time. He and the rest of the staff were great, would definitely recommend staying here! Amazing kind and helpful staff! Pretty good facilities, although wifi basically didn't connect properly for the duration of my stay. Good location. Decent sized rooms, with key card lockers, so security was good. Very well equipped kitchen and a really good selection of food at breakfast. However, the showers are not private at all: no lock on the outside door and the actual shower door you can see under. They also flood really badly. My clothes got soaked the first time. It's so noisy too. I rarely slept before 1am as the 11pm quiet time is basically ignored. One night, other guests predrinking invited themselves into my room! Bathrooms were really dirty, and floors seemed unswept. Just felt very unclean overall. I'd say what puts us ahead of the rest is our amazing location; we're very close to two of the famous Gaudí buildings- La Casa Battló and La Pedrera - and the Gothic area. A local place I particularly recommend is Task i Vins restaurant...it's an awesome place for paella and good sangria. For fun around the hostel our guests usually play some drinking games or go on our free pub crawl. They also seem to enjoy our hostel dinners!